← Fair Sentencing for Youth? How Much Can Your Employer Pry Into Your Criminal Record? What do you say if you are applying for a job and the application asks about old convictions, and you have a ten year-old conviction for DUI? Or if you were arrested but never charged? Or you got your conviction dismissed? Or if you participated in a pretrial or posttrial diversion program? Or if it was just a conviction for a small amount of marijuana? Not telling the truth can have serious consequences down the road. If the employer does a criminal background check and discovers an unreported charge, in some cases they have grounds to terminate employment. 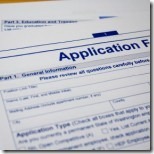 Employers, however, are prohibited from digging into certain areas of employees’ and applicants’ criminal records. There are different rules for private and public employers. And for certain jobs, such as law enforcement, jobs involving unsupervised contact with minors or the elderly, or patients or medications, employers may look further. Below is a breakdown of the law. If you have further questions, an experienced employment or defense attorney can help. Misdemeanor convictions that have been dismissed pursuant to Penal Code section 1203.4. Exception: if you will be having unsupervised contact with minors, working with patients or medications in a health care or assisted living facility, or applying for licensure to any state or local agency—but if you have gotten the conviction dismissed, you may state that the conviction was dismissed. Successful completion of a pretrial or posttrial diversion program (community service, graffiti removal, mentor programs, substance about counseling, domestic violence counseling, etc.). Convictions for small amounts of marijuana or related paraphernalia that are over two years old. Exception: health facilities may ask about arrests, diversion programs, and older marijuana and marijuana related convictions if the employee or applicant seeks to hold a position working with patients or drugs and medications. Law enforcement agencies also have an exception, although those agencies are usually public, not private, employers. Arrests for which the employee or applicant is currently out on bail or currently out on his or her own recognizance pending trial. *If you were arrested but charges were never filed, you may want to file a petition with the court to get your arrest reduced to a detention. An experienced attorney can assist you with this procedure. **If you have a conviction for which you have successfully completed probation, you may be able to get the conviction dismissed with the assistance of an attorney (Expungements). Exception: law enforcement and health facilities may ask about the above if the employee or applicant seeks to hold a position as a peace officer, with the Department of Justice, or working with patients or drugs and medications. Arrests for which the employee or applicant is out on bail or out on his or her own recognizance pending trial. Convictions that have not been dismissed (including by plea, verdict, or a finding of guilt where no sentence was imposed). *Frequently, licensing boards and other governmental entities ask applicants about arrests but not detentions. If you have on your record an arrest that did not result in conviction, you may want to petition the court for a certificate of detention only (a remedy available under California Penal Code Section 849.5). An experienced attorney can help you with this procedure. Contact attorney Thomas Greenberg for a free lawyer consultation to learn more.